1874: born in Hongô in the district of Tenjin-chô. His father was most likely a blue-blooded Frenchman. He is adopted by Ichimura Uzaemon XIV, who gives him the name of Ichimura Rokutarô. January 1881: he makes his first appearance on stage sous le nom of Bandô Takematsu at the Shintomiza. November 1883: premiere at the Ichimuraza of Kawatake Mokuami's drama "Zôho Tenjiku Tokubê", a revision of Tsuruya Nanboku IV's "Tenjiku Tokubê Ikoku Banashi"; Takematsu plays the role of Kakuzô's son Minomatsu [casting]. January 1885: two dances are staged at the Chitoseza, about to reopen in February 1885 with a new name. From the 4th to the 7th of January, two auspicious dances and a kôjô with the troupe led by Ichikawa Danjûrô IX are staged. The sanbasô is staged with Ichikawa Sadanji I (Okina), Bandô Kakitsu I (Senzai) and Onoe Kikugorô V (Sanbasô). This is also the premiere of the Nagauta-based dance-drama "Tsuru Kame"; Kakitsu plays the role of the Crane [more details]. July 1893: Bandô Takematsu takes the name of Ichimura Kakitsu VI at the Kabukiza. November 1897: Kakitsu plays at the Misonoza (Nagoya) the role of Yosaburô in the drama "Yowa Nasaka Ukina no Yokogushi"; the role of Otomi is played by Nakamura Umesaburô. May 1898: premiere at the Kabukiza of Kawatake Shinshichi III's drama "Edo Sodachi Omatsuri Sashichi"; Kakitsu plays the role of Mi no Sankichi [casting]. September 1898: Kakitsu plays at the Miyatoza the role of Saitô Bettô Sanemori in the drama "Sanemori Monogatari". July 1899: Kakitsu plays at the Miyatoza the role of Sasaki Moritsuna in the drama "Ômi Genji Senjin Yakata" (first performance in this role). June 1900: Kakitsu plays at the Tôkyôza the role of Saitô Bettô Sanemori in the drama "Sanemori Monogatari". July 1900: Kakitsu plays at the Kabukiza the role of Yosaburô in the drama "Yowa Nasaka Ukina no Yokogushi"; the role of Otomi is played by Onoe Eizaburô V.
September 1900: Kakitsu plays at the Miyatoza the role of Saitô Bettô Sanemori in the drama "Sanemori Monogatari". March 1901: Kakitsu plays at the Miyatoza the role of Fujiya Izaemon in the drama "Kuruwa Bunshô"; the role of Yûgiri is played by Iwai Matsunosuke IV. July 1902: Kakitsu plays at the Kabukiza the role of Saitô Bettô Sanemori in the drama "Sanemori Monogatari". October 1902: premiere at the Kabukiza of Enokido Kenji's drama "Ninjô Banashi Bunshichi Mottoi"; Kakitsu plays the role of the Izumiya tedai Bunshichi [casting]. August 1903: Kakitsu plays at the Kadoza the role of Yosaburô in the drama "Yowa Nasaka Ukina no Yokogushi"; the role of Otomi is played by Nakamura Shikan V.
October 1903: Ichimura Kakitsu VI takes the name of Ichimura Uzaemon XV at the Kabukiza. November 1903: Uzaemon plays at the Kabukiza the role of Fujiya Izaemon in the drama "Kuruwa Bunshô"; the role of Yûgiri is played by Onoe Baikô VI. June 1904: premiere at the Kabukiza of the drama "Meiboku Kasane Monogatari"; Uzaemon plays the role of Princess Utakata [casting]. May 1905: Uzaemon plays at the Kabukiza the role of Sasaki Moritsuna in the drama "Ômi Genji Senjin Yakata". September 1905: Uzaemon plays at the Misonoza (Nagoya) the role of Saitô Bettô Sanemori in the drama "Sanemori Monogatari". May 1906: Uzaemon plays at the Kabukiza the role of Sukeroku in the drama "Sukeroku Yukari no Edo Zakura"; the roles of Agemaki, Shinbê and Ikyû are played by Onoe Baikô VI, Ichikawa Komazô VIII and Ichikawa Yaozô VII. July 1906: Uzaemon plays at the Ichimuraza the role of Yosaburô in the drama "Yowa Nasaka Ukina no Yokogushi"; the role of Otomi is played by Onoe Baikô VI. November 1908: revival at the Kabukiza of the Kabuki Jûhachiban drama "Kagekiyo"; Uzaemon plays the role of Nitan no Shirô Tadatsune [casting]. May 1909: Uzaemon plays at the Kadoza the role of Yosaburô in the drama "Yowa Nasaka Ukina no Yokogushi"; the role of Otomi is played by Onoe Baikô VI. January 1910: Uzaemon plays at the Kabukiza the role of Saitô Bettô Sanemori in the drama "Sanemori Monogatari". April 1910: premiere at the Kabukiza of "Yuki no Yûbe Iriya no Azemichi", a few scenes taken from "Kumo ni Magou Ueno no Hatsuhana" focusing on Kataoka Naojirô and his lover Michitose and staged independently from the rest of the play; Uzaemon plays the role of Kataoka Naojirô [casting]. May 1911: premiere at the Meijiza of the Okamoto Kidô's drama "Shuzenji Monogatari"; Uzaemon plays the role of Minamoto no Yoriie [casting]. November 1911: Uzaemon plays at the Kabukiza the role of Sasaki Moritsuna in the drama "Ômi Genji Senjin Yakata". February 1913: Uzaemon plays at the Kyôtoza (Kyôto) the role of Saitô Bettô Sanemori in the drama "Sanemori Monogatari". June 1914: Uzaemon plays at the Kabukiza the role of Saitô Bettô Sanemori in the drama "Sanemori Monogatari". April 1915: Uzaemon plays at the Kabukiza the role of Sukeroku in the drama "Sukeroku Yukari no Edo Zakura"; the roles of Agemaki, Shinbê and Ikyû are played by Nakamura Utaemon V, Jitsukawa Enjirô I and Ichikawa Yaozô VII. September 1916: Uzaemon plays at the Kabukiza the role of Sasaki Moritsuna in the drama "Ômi Genji Senjin Yakata". He also plays the role of Yosaburô in the drama "Yowa Nasaka Ukina no Yokogushi"; the role of Otomi is played by Onoe Baikô VI. May 1917: Uzaemon plays at the Misonoza (Nagoya) the role of Sasaki Moritsuna in the drama "Ômi Genji Senjin Yakata". He also plays the role of Yosaburô in the drama "Yowa Nasaka Ukina no Yokogushi"; the role of Otomi is played by Onoe Baikô VI. September 1917: Uzaemon plays at the Kabukiza the role of Ôboshi Rikiya in the classic "Kanadehon Chûshingura"; the role of Ôboshi Yuranosuke is played by Ichikawa Yaozô VII. February 1919: Uzaemon plays at the Kabukiza the role of Kajiwara Heizô Kagetoki in the drama "Na mo Tachibana Homare no Ishikiri". December 1920: Uzaemon plays at the Kabukiza the role of Yosaburô in the drama "Yowa Nasaka Ukina no Yokogushi"; the role of Otomi is played by Onoe Baikô VI. April 1921: Uzaemon plays at the Kabukiza the roles of Hayano Kanpei and En'ya Hangan in the classic "Kanadehon Chûshingura". June 1921: Uzaemon plays at the Imperial Theater the role of Kajiwara Heizô Kagetoki in the drama "Na mo Tachibana Homare no Ishikiri". May 1922: Uzaemon plays at the Shintomiza the role of Saitô Bettô Sanemori in the drama "Sanemori Monogatari". June 1922: Uzaemon plays at the Kabukiza the roles of Hayano Kanpei and Teraoka Heiemon in the classic "Kanadehon Chûshingura". December 1922: Uzaemon plays at the Yokohamaza (Yokohama) the role of Saitô Bettô Sanemori in the drama "Sanemori Monogatari". February 1923: Uzaemon plays at the Shintomiza the role of Yosaburô in the drama "Yowa Nasaka Ukina no Yokogushi"; the role of Otomi is played by Onoe Baikô VI. June 1923: Uzaemon plays at the Imperial Theater the role of Sasaki Moritsuna in the drama "Ômi Genji Senjin Yakata". February 1924: Uzaemon plays at the Nakaza the role of Yosaburô in the drama "Yowa Nasaka Ukina no Yokogushi"; the role of Otomi is played by Onoe Baikô VI. March 1924: Uzaemon plays at the Nakaza the roles of Hayano Kanpei and En'ya Hangan in the classic "Kanadehon Chûshingura". September 1924: Uzaemon plays at the Misonoza (Nagoya) the role of Yosaburô in the drama "Yowa Nasaka Ukina no Yokogushi"; the role of Otomi is played by Onoe Baikô VI. February 1925: Uzaemon plays at the Kabukiza the role of Sukeroku in the drama "Sukeroku Yukari no Edo Zakura"; the roles of Agemaki, Shinbê and Ikyû are played by Onoe Baikô VI, Sawamura Sôjûrô VII and Matsumoto Kôshirô VII. April 1925: Uzaemon plays at the Imperial Theater the role of Yosaburô in the drama "Yowa Nasaka Ukina no Yokogushi"; the role of Otomi is played by Onoe Baikô VI. October 1925: Uzaemon plays at the Kabukiza the role of Sasaki Moritsuna in the drama "Ômi Genji Senjin Yakata". May 1926: Uzaemon and Onoe Baikô VI finance the building of a mound and the erection of a stone dedicated to kasane, the heroine of many kasanemono, in the precinct of the Yûtenji temple in the district of Meguro (Tôkyô). This stone is called Kasanezuka and it is a custom for actors about to perform the role of kasane to go there and pray in order to avoid any malicious trick of the ghost of Kasane during their performance. July 1926: premiere at the Kabukiza of Okamoto Kidô's drama "Gonza to Sukejû"; Uzaemon plays the role of Gonza [casting]. January 1927: Uzaemon plays at the Kabukiza the role of Mashiba Hisayoshi in the drama "Sanmon"; the role of Ishikawa Goemon is played by Ichikawa Chûsha VII. June 1927: Uzaemon plays at the Imperial Theater the role of Yosaburô in the drama "Yowa Nasaka Ukina no Yokogushi"; the role of Otomi is played by Onoe Baikô VI. July 1927: premiere at the Kabukiza of "Shunshoku Ume Goyomi", an adaptation to Kabuki by the playwright Kimura Kinka of Tamenaga Shunsui's 1833 novel; Uzaemon plays the role of Karakotoya Tanjirô [casting]. December 1927: Uzaemon plays at the Kabukiza the role of Kajiwara Heizô Kagetoki in the drama "Na mo Tachibana Homare no Ishikiri". March 1928: Uzaemon plays at the Kabukiza the role of Saitô Bettô Sanemori in the drama "Sanemori Monogatari". November 1928: Uzaemon plays at the Kabukiza the role of Yosaburô in the drama "Yowa Nasaka Ukina no Yokogushi"; the role of Otomi is played by Ichikawa Shôchô II. January 1929: Uzaemon plays at the Imperial Theater the role of Tôkichi in the drama "Gion Sairei Shinkôki"; the roles of Daizen and Princess Yuki are played by Matsumoto Kôshirô VII and Sawamura Sôjûrô VII. March 1929: Uzaemon plays at the Kabukiza the role of Sukeroku in the drama "Sukeroku Yukari no Edo Zakura"; the roles of Agemaki, Shinbê and Ikyû are played by Onoe Baikô VI, Sawamura Sôjûrô VII and Matsumoto Kôshirô VII. November 1929: revival at the Kabukiza of the drama "Kan U", which belongs to the Kabuki Jûhachiban; Uzaemon plays the role of Hatakeyama no Shigetada, later the Chinese general Chô Hi [casting]. January 1930: Uzaemon plays at the Kabukiza the role of Togashi in the dance-drama "Kanjinchô"; the roles of Benkei and Yoshitsune are played by Matsumoto Kôshirô VII and Sawamura Sôjûrô VII. February 1930: Uzaemon plays at the Meijiza the role of Matsuômaru in the "Kurumabiki" scene of the classic "Sugawara Denju Tenarai Kagami". His stage partners are Onoe Kikugorô VI (Umeômaru), Sawamura Sôjûrô VII (Sakuramaru) and Onoe Kôzô II (Shihei). July 1930: Uzaemon plays at the Kabukiza the role of Yosaburô in the drama "Yowa Nasaka Ukina no Yokogushi"; the role of Otomi is played by Onoe Baikô VI. January 1931: Uzaemon plays at the Kabukiza the role of Fujiya Izaemon in the drama "Kuruwa Bunshô"; the role of Yûgiri is played by Onoe Baikô VI. March 1931: Uzaemon plays at the Tôkyô Gekijô the role of Hosokawa Katsumoto in the drama "Meiboku Sendai Hagi"; the role of Nikki Danjô is played by Onoe Kikugorô VI. May 1931: Uzaemon plays at the Nakaza the role of Yosaburô in the drama "Yowa Nasaka Ukina no Yokogushi"; the role of Otomi is played by Onoe Baikô VI. 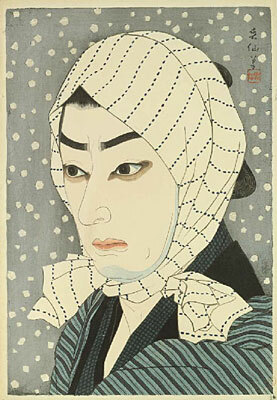 November 1931: Uzaemon plays at the Kabukiza the role of En'ya Hangan in the classic "Kanadehon Chûshingura". January 1932: Uzaemon plays at the Kabukiza the role of Kajiwara Heizô Kagetoki in the drama "Na mo Tachibana Homare no Ishikiri". February 1932: Uzaemon plays at the Tôkyô Gekijô the role of Ojô Kichisa in the drama "Sannin Kichisa". His stage partners are Onoe Kikugorô VI (Oshô Kichisa) and Nakamura Kichiemon I (Obô Kichisa). March 1932: the duo Kikugorô/Uzaemon plays for the first time the roles of Kasane and Yoemon in the dance-drama "Iro Moyô Chotto Karimame", which is staged at the Kabukiza. June 1932: premiere at the Kabukiza of Hasegawa Shin's drama "Irezumi Chôhan"; Uzaemon plays the role of Masagorô [casting]. September 1932: Uzaemon plays at the Kabukiza the role of Sasaki Moritsuna in the drama "Ômi Genji Senjin Yakata". November 1932: Uzaemon plays at the Kabukiza the role of Sukeroku in the drama "Sukeroku Yukari no Edo Zakura"; the roles of Agemaki, Shinbê and Ikyû are played by Onoe Baikô VI, Onoe Kikugorô VI and Matsumoto Kôshirô VII. Uzaemon also plays the role of Togashi in the dance-drama "Kanjinchô"; the roles of Benkei and Yoshitsune are played by Matsumoto Kôshirô VII and Onoe Kikugorô VI. December 1932: Uzaemon plays at the Minamiza the role of Yosaburô in the drama "Yowa Nasaka Ukina no Yokogushi"; the role of Otomi is played by Onoe Baikô VI. January 1933: Uzaemon plays at the Kabukiza the role of Togashi in the dance-drama "Kanjinchô"; the roles of Benkei and Yoshitsune are played by Matsumoto Kôshirô VII and Onoe Kikugorô VI. March 1933: Uzaemon plays at the Ôsaka Kabukiza the role of Sukeroku in the drama "Sukeroku Yukari no Edo Zakura"; the roles of Agemaki, Shinbê and Ikyû are played by Onoe Baikô VI, Sawamura Sôjûrô VII and Matsumoto Kôshirô VII. Uzaemon also plays the role of Togashi in the dance-drama "Kanjinchô"; the roles of Benkei and Yoshitsune are played by Matsumoto Kôshirô VII and Sawamura Sôjûrô VII. April 1933: Uzaemon plays at the Kabukiza the role of Yosaburô in the drama "Yowa Nasaka Ukina no Yokogushi"; the role of Otomi is played by Onoe Baikô VI. October 1933: Uzaemon plays at the Kabukiza the role of Yosaburô in the drama "Yowa Nasaka Ukina no Yokogushi"; the role of Otomi is played by Onoe Baikô VI. January 1934: Uzaemon plays at the Kabukiza the role of Katsuyori in the drama "Honchô Nijûshikô". His stage partners are Onoe Kikugorô VI (Princess Yaegaki) and Onoe Baikô VI (Nureginu). Uzaemon also plays the role of Matsuômaru in the "Kurumabiki" scene of the classic "Sugawara Denju Tenarai Kagami". His stage partners are Onoe Kikugorô VI (Sakuramaru) and Matsumoto Kôshirô VII (Umeômaru). February 1934: Uzaemon plays at the Kabukiza the role of Tôkichi in the drama "Gion Sairei Shinkôki"; the roles of Daizen and Princess Yuki are played by Matsumoto Kôshirô VII and Sawamura Sôjûrô VII. March 1934: Uzaemon plays at the Ôsaka Kabukiza the role of Yosaburô in the drama "Yowa Nasaka Ukina no Yokogushi"; the role of Otomi is played by Onoe Baikô VI. 8 November 1934: his best onnagata stage partner Onoe Baikô VI dies. November 1934: Uzaemon plays at the Kabukiza the role of Togashi in the dance-drama "Kanjinchô"; the roles of Benkei and Yoshitsune are played by Matsumoto Kôshirô VII and Onoe Kikugorô VI. December 1934: Uzaemon plays at the Minamiza the role of Sukeroku in the drama "Sukeroku Yukari no Edo Zakura"; the roles of Agemaki, Shinbê and Ikyû are played by Nakamura Fukusuke IV, Kataoka Gadô IV and Matsumoto Kôshirô VII. Uzaemon also plays the role of Togashi in the dance-drama "Kanjinchô"; the roles of Benkei and Yoshitsune are played by Matsumoto Kôshirô VII and Kataoka Gadô IV. January 1935: Uzaemon plays at the Kabukiza the role of Obô Kichisa in the drama "Sannin Kichisa". His stage partners are Onoe Kikugorô VI (Ojô Kichisa) and Matsumoto Kôshirô VII (Oshô Kichisa). April 1935: Uzaemon plays at the Kabukiza the role of Saitô Bettô Sanemori in the drama "Sanemori Monogatari". November 1935: Uzaemon plays at the Kabukiza the role of Yosaburô in the drama "Yowa Nasaka Ukina no Yokogushi"; the role of Otomi is played by Kataoka Gadô IV. January 1936: Uzaemon plays at the Kabukiza the roles of Yashio and Hosokawa Katsumoto in the drama "Meiboku Sendai Hagi"; the roles of Masaoka and Nikki Danjô are played by Onoe Kikugorô VI. December 1936: Uzaemon plays at the Minamiza the role of Sasaki Moritsuna in the drama "Ômi Genji Senjin Yakata". January 1937: Uzaemon plays at the Kabukiza the role of Sakuramaru in the "Kurumabiki" scene of the classic "Sugawara Denju Tenarai Kagami". His stage partners are Onoe Kikugorô VI (Matsuômaru), Matsumoto Kôshirô VII (Umeômaru) and Nakamura Utaemon V (Shihei). Uzaemon also plays the role of Kajiwara Heizô Kagetoki in the drama "Na mo Tachibana Homare no Ishikiri". April 1937: Uzaemon plays at the Kabukiza the role of Togashi in the dance-drama "Kanjinchô"; the roles of Benkei and Yoshitsune are played by Matsumoto Kôshirô VII and Onoe Kikugorô VI. June 1937: Uzaemon plays at the Kabukiza the role of Katsuyori in the drama "Honchô Nijûshikô". His stage partners are Onoe Kikugorô VI (Princess Yaegaki) and Sawamura Sôjûrô VII (Nureginu). December 1937: Uzaemon plays at the Minamiza the role of Togashi in the dance-drama "Kanjinchô"; the roles of Benkei and Yoshitsune are played by Matsumoto Kôshirô VII and Kataoka Nizaemon XII. March 1938: Uzaemon plays at the Ôsaka Kabukiza the role of Sukeroku in the drama "Sukeroku Yukari no Edo Zakura"; the roles of Agemaki, Shinbê and Ikyû are played by Kataoka Nizaemon XII, Nakamura Kaisha and Ôtani Tomoemon VI. Uzaemon also plays the role of Togashi in the dance-drama "Kanjinchô"; the roles of Benkei and Yoshitsune are played by Matsumoto Kôshirô VII and Kataoka Nizaemon XII. April 1938: Uzaemon plays at the Kabukiza the role of Yosaburô in the drama "Yowa Nasaka Ukina no Yokogushi"; the role of Otomi is played by Kataoka Nizaemon XII. May 1938: Uzaemon plays at the Tôkyô Gekijô the role of Hosokawa Katsumoto in the drama "Meiboku Sendai Hagi"; the role of Nikki Danjô is played by Ichikawa Sadanji II. June 1938: Uzaemon plays at the Kabukiza the role of Sasaki Moritsuna in the drama "Ômi Genji Senjin Yakata". September 1938: Uzaemon plays at the Misonoza (Nagoya) the role of Kajiwara Heizô Kagetoki in the drama "Na mo Tachibana Homare no Ishikiri". November 1938: Uzaemon plays at the Kabukiza the role of Yoshitsune in the dance-drama "Kanjinchô"; the roles of Benkei and Togashi are played by Matsumoto Kôshirô VII and Ichikawa Sadanji II. December 1938: Uzaemon plays at the Minamiza the role of Saitô Bettô Sanemori in the drama "Sanemori Monogatari". He also plays the role of Yoshitsune in the dance-drama "Kanjinchô"; the roles of Benkei and Togashi are played by Matsumoto Kôshirô VII and Ichikawa Sadanji II. March 1939: Uzaemon plays at the Kabukiza the role of Sukeroku in the drama "Sukeroku Yukari no Edo Zakura"; the roles of Agemaki, Shinbê and Ikyû are played by Kataoka Nizaemon XII, Nakamura Baigyoku III and Ôtani Tomoemon VI. May 1939: Uzaemon plays at the Kabukiza the role of Kajiwara Heizô Kagetoki in the drama "Na mo Tachibana Homare no Ishikiri". December 1939: Uzaemon plays at the Minamiza the role of Sasaki Moritsuna in the drama "Ômi Genji Senjin Yakata". January 1940: Uzaemon plays at the Kabukiza the role of Hosokawa Katsumoto in the drama "Meiboku Sendai Hagi"; the role of Nikki Danjô is played by Matsumoto Kôshirô VII. February 1940: Uzaemon plays at the Shinbashi Enbujô the role of Yosaburô in the drama "Yowa Nasaka Ukina no Yokogushi"; the role of Otomi is played by Kataoka Nizaemon XII. March 1940: Uzaemon plays at the Kabukiza the roles of Hayano Kanpei and En'ya Hangan in the classic "Kanadehon Chûshingura". May 1940: Uzaemon plays at the Kabukiza the role of Igami no Gonta in the "Sushiya" scene of the classic "Yoshitsune Senbon Zakura". March 1941: Uzaemon plays at the Kabukiza the role of Togashi in the dance-drama "Kanjinchô"; the roles of Benkei and Yoshitsune are played by Matsumoto Kôshirô VII and Kataoka Nizaemon XII. Uzaemon also plays the role of Hosokawa Katsumoto in the drama "Meiboku Sendai Hagi"; the role of Nikki Danjô is played by Matsumoto Kôshirô VII. April 1941: Uzaemon plays at the Kabukiza the role of Saitô Bettô Sanemori in the drama "Sanemori Monogatari". May 1941: Uzaemon plays at the Kabukiza the role of Yosaburô in the drama "Yowa Nasaka Ukina no Yokogushi"; the role of Otomi is played by Kataoka Nizaemon XII. He also plays the role of Sukeroku in the drama "Sukeroku Yukari no Edo Zakura"; the roles of Agemaki, Shinbê and Ikyû are played by Kataoka Nizaemon XII, Sawamura Sôjûrô VII and Ôtani Tomoemon VI. November 1941: Uzaemon plays at the Kabukiza the role of Yosaburô in the drama "Yowa Nasaka Ukina no Yokogushi"; the role of Otomi is played by Kataoka Nizaemon XII. December 1941: Uzaemon plays at the Minamiza the role of Yosaburô in the drama "Yowa Nasaka Ukina no Yokogushi"; the role of Otomi is played by Kataoka Nizaemon XII. He also plays the role of Togashi in the dance-drama "Kanjinchô"; the roles of Benkei and Yoshitsune are played by Matsumoto Kôshirô VII and Kataoka Nizaemon XII. Uzaemon also plays the role of Hosokawa Katsumoto in the drama "Meiboku Sendai Hagi"; the role of Nikki Danjô is played by Matsumoto Kôshirô VII. January 1942: Uzaemon plays at the Kabukiza the role of Kajiwara Heizô Kagetoki in the drama "Na mo Tachibana Homare no Ishikiri". March 1942: Uzaemon plays at the Kabukiza the role of Sasaki Moritsuna in the drama "Ômi Genji Senjin Yakata". April 1942: Uzaemon plays at the Kabukiza the role of Igami no Gonta in the "Sushiya" scene of the classic "Yoshitsune Senbon Zakura". He also plays the role of Tadanobu (in reality the fox Genkurô) in the dance-drama "Michiyuki Hatsune no Tabi"; the role of Shizuka Gozen is played by Kataoka Nizaemon XII. June 1942: Uzaemon plays at the Kabukiza the role of Yosaburô in the drama "Yowa Nasaka Ukina no Yokogushi"; the role of Otomi is played by Kataoka Nizaemon XII. December 1942: Uzaemon plays at the Kabukiza the role of Fujiya Izaemon in the drama "Kuruwa Bunshô"; the role of Yûgiri is played by Kataoka Nizaemon XII. Uzaemon also plays the role of Saitô Bettô Sanemori in the drama "Sanemori Monogatari". April 1943: Uzaemon plays at the Kabukiza the role of Yosaburô in the drama "Yowa Nasaka Ukina no Yokogushi"; the role of Otomi is played by Kataoka Nizaemon XII. Uzaemon also plays the role of Hosokawa Katsumoto in the drama "Meiboku Sendai Hagi"; the role of Nikki Danjô is played by Onoe Kikugorô VI. June 1943: Uzaemon plays at the Kabukiza the role of Saitô Bettô Sanemori in the drama "Sanemori Monogatari". October 1943: Uzaemon plays at the Kabukiza the role of Sasaki Moritsuna in the drama "Ômi Genji Senjin Yakata" (last performance in this role). November 1943: Uzaemon plays at the Kabukiza the role of Togashi in the dance-drama "Kanjinchô"; the roles of Benkei and Yoshitsune are played by Matsumoto Kôshirô VII and Onoe Kikugorô VI. Uzaemon also plays the role of the role of Igami no Gonta in the "Sushiya" scene of the classic "Yoshitsune Senbon Zakura". December 1943: the duo Kikugorô/Uzaemon plays for the last time the roles of Kasane and Yoemon in the dance-drama "Iro Moyô Chotto Karimame", which is staged at the Kabukiza. Uzaemon also plays the role of Togashi in the dance-drama "Kanjinchô"; the roles of Benkei and Yoshitsune are played by Matsumoto Kôshirô VII and Onoe Kikugorô VI. Uzaemon also plays the role of Kajiwara Heizô Kagetoki in the drama "Na mo Tachibana Homare no Ishikiri". February 1944: Uzaemon plays at the Kabukiza the roles of Hanaregoma Chôkichi and Yamazaki Yogorô in the "Sumôba" scene of the drama "Futatsu Chôchô Kuruwa Nikki". His stage partners are Onoe Kikugorô VI (Nuregami Chôgorô) and Onoe Kikunosuke III (the courtesan Azuma). March 1944: Uzaemon plays at the Ôsaka Kabukiza the role of Miuranosuke in the drama "Kamakura Sandaiki". His stage partners in the roles of Sasaki Takatsuna and Princess Toki are Jitsukawa Enjaku II and Nakamura Baigyoku III. He also plays the role of Yosaburô in the drama "Yowa Nasaka Ukina no Yokogushi"; the role of Otomi is played by Kataoka Nizaemon XII. May 1944: Uzaemon plays at the Shinbashi Enbujô the role of Kajiwara Heizô Kagetoki in the drama "Na mo Tachibana Homare no Ishikiri". October 1944: Uzaemon plays at the Meijiza the role of Saitô Bettô Sanemori in the drama "Sanemori Monogatari". December 1944: Uzaemon plays at the Minamiza the role of Yosaburô in the drama "Yowa Nasaka Ukina no Yokogushi"; the role of Otomi is played by his son Ichimura Kakitsu VII. Uzaemon also plays the role of Kajiwara Heizô Kagetoki in the drama "Na mo Tachibana Homare no Ishikiri". Ichimura Uzaemon XV gathered his best roles in a special collection named Kakôshû: Kajiwara Heizô Kagetoki ("Ishikiri Kajiwara"), Yosaburô ("Kirare Yosa"), Saitô Bettô Sanemori ("Sanemori Monogatari"), Gosho no Gorozô ("Soga Moyô Tateshi no Goshozome"), Igami no Gonta ("Sushiya"), Sasaki Moritsuna ("Moritsuna Jin'ya"), Omatsuri Sashichi ("Edo Sodachi Omatsuri Sashichi"), Sukeroku ("Sukeroku"), Hayano Kanpei ("Kanadehon Chûshingura"), Kataoka Naojirô ("Naozamurai"), Shirai Gonpachi ("Suzu-ga-Mori") and Togashi ("Kanjinchô"). His others great roles, not included in the "Kakôshû", were Mitsugi ("Ise Ondo Koi no Netaba"), Katsuyori ("Jusshukô") and Sakuramaru ("Sugawara Denju Tenarai Kagami").